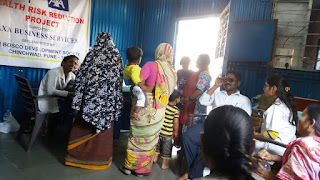 Chinchwad (Pune), 23-Jan-2018: The Don Bosco Development Society (DBDS), Chinchwad organized a free eye check-up camp for the people in Ambedkar Nagar slum in Chinchwad. 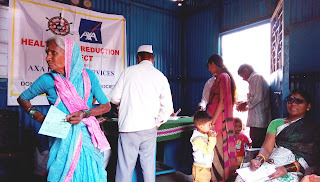 61 people (45 women, 11 Men and 5 children) benefited from this camp held under the aegis of ‘Health Risk Reduction Project’ supported by AXA Business Services Pvt Ltd. The objective of this camp was to detect eye disorders, refractive errors and create awareness on early detection of diseases and disorders related to eyes. The camp was organized in collaboration with H.V. Desai Hospital, Pune. 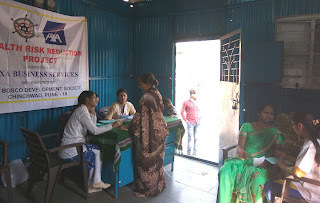 Dr. Aparna Dhite and Sharad Shinde examined the patients. 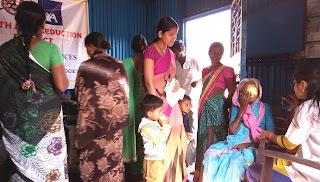 5 Cataract cases were identified in this camp. They were referred to H.V.Desai Hospital for Surgery.